There are currently 35 million people living with HIV and AIDS around the world. World wide, women constitute more than half of all people living with the disease and in sub-Saharan African, women make up 57% of all people living with HIV and AIDS. Frustina Shaba is one of these women. Frustina is a widowed mother of five and lives with her son and daughter-in-law in northern Malawi. Her husband died of AIDS seven years ago. At the time, though she didn’t know for certain, she was very concerned that she also had the disease. “I was in denial. 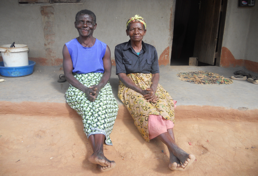 I didn’t even want anyone to talk about HIV in my presence,” Frustina shares. But finally, after being sick off and on, her daughter convinced her to be tested. Frustina tested positive and started treatment the same day. Although she had initially been concerned about how her community would treat her after she received her diagnosis, Frustina was overwhelmed by the outpouring of support she received. Her relatives immediately let home-based care volunteers—supported through a PWS&D program—know she was ill. Frustina also began receiving counselling at the hospital. PWS&D is providing support and training for home based care—ensuring community volunteers have the knowledge and skills they need to encourage, assist and provide loving care to people living with and affected by HIV and AIDS. Through your generous support, people living with and affected by HIV and AIDS are once again becoming active members of their communities as they access medical care, nutritional supplements and find acceptance in their families and communities. Make a donation today!